Previously announced 7th Fraunhofer IMS Workshop on CMOS Imaging: From Photon to Camera to be held in Duisburg, Germany om May 20-21, 2014, announces a change in its agenda: the new Aptina CTO Sandor Barna will present "Evolution and Limitations for Mobile Image Sensors." PR Newswire: Omnivision's revenues for the recent quarter, ended on Jan 31, 2013 were $352.0M, as compared to $397.2M in the previous quarter, and $423.5M a year ago. GAAP net income in the quarter was $30.6M, as compared to net income of $26.3M in the previous quarter, and $21.3M a year ago. GAAP gross margin for the last quarter was 19.6%, as compared to 18.8% in the previousr quarter or 16.9% a year ago. The sequential increase in gross margin was primarily attributable to continued reduction in the company's overall production costs. The company ended the period with cash, cash equivalents and short-term investments totaling $393.0M, an increase of $127.4M from the previous quarter. The increase was primarily attributable to cash provided by operating activities in the last quarter. Based on current trends, the company expects revenues for the next quarter will be in the range of $275M to $305M. "Our third quarter performance was better than we expected, and we continued to report improvements on multiple financial metrics, including gross margin and cash position," said Shaw Hong, CEO of OmniVision. "Our flagship PureCel sensors are gaining traction in the market. 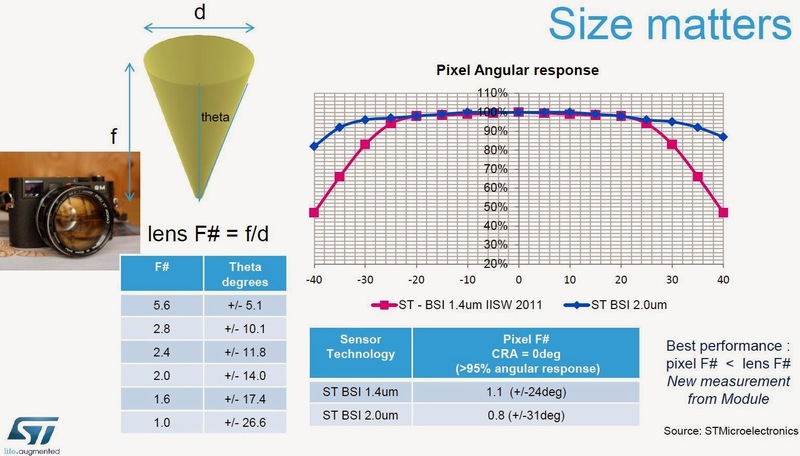 PureCel sensors have significantly better pixel performance, lower power consumption, and an attractive cost structure. We are very excited about our new product lineup." "we shipped 214 million units as compared to the 237 million units in our prior quarter. The average selling price in our third quarter was $1.64 as compared to $1.67 in the prior quarter. The slight decrease in the ASP was driven by quarterly price erosion across product lines in all regional markets." 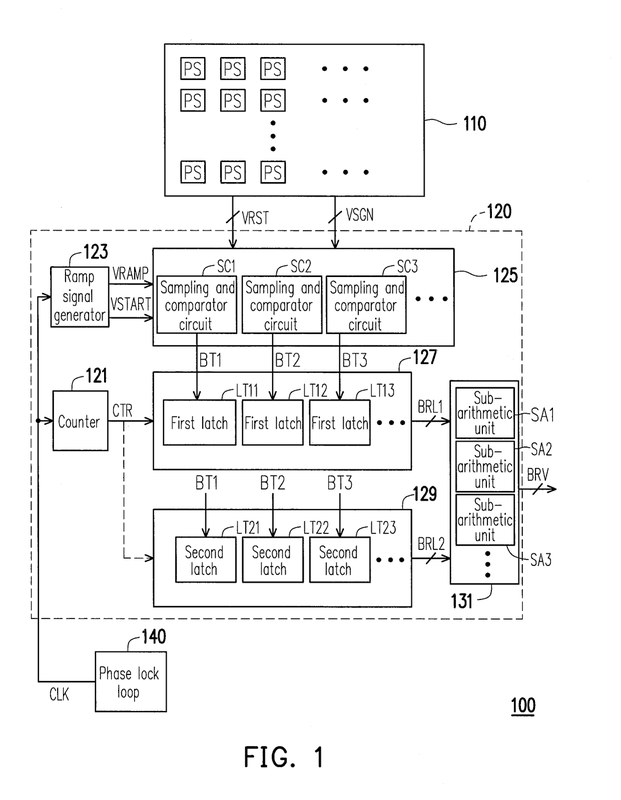 "Related to licensing of certain CMOS image sensor-related patents from the California Institute of Technology for the [licensing] arrangement that total fee was approximately $25.3 million. "- this is a flat fee, not tied to the number of units sold, as later clarified in Q&A session. Teledyne DALSA announces that it has received a financial commitment totaling $13M from Investissement Québec to expand the Company’s MEMS and Infrared Imaging capabilities in the Province of Québec. Out of that amount, a $10M is intended to develop advanced IR products at its Bromont and Montreal facilities. Teledyne DALSA is extending its reach beyond its visible and X-ray products into infrared imaging to be "able to see the heat the objects emit", that is MWIR or LWIR. "MEMS and Infrared Imaging are two strategic areas of focus for Teledyne DALSA with good growth potential," commented Brian Doody, CEO of Teledyne DALSA, Inc. "The development and full production of infrared devices in Québec will further strengthen our position as a leader in digital imaging and semiconductors, at a time when the infrared imaging market is experiencing strong growth." Business Wire, 1st Samsung Tomorrow post, 2nd Samsung Tomorrow post: Samsung’s new 13MP ISOCELL CIS features Smart WDR technology, which allows users to capture images at 30fps. With a mosaic pattern of multiple exposures, images are then processed with an advanced algorithm for wider dynamic range. This Smart WDR feature is based on Samsung’s advanced 65nm stacked process, where the pixel array is attached on top of the logic circuit. Samsung’s 13MP product is sampling now and is scheduled for mass production in Q2 2014. Another newly announced sensor, a 16MP ISOCELL, has a 16:9 aspect ratio. This high-speed sensor captures full FOV 16:9 full HD (1080p) video at 60fps, and for the first time in the industry, enables continuous shooting of all 16MP at 30fps. Samples of the 16MP ISOCELL CIS are available now and scheduled for mass production in Q1 2014.
Business Wire: A gesture recognition company PointGrab won the prize for the “2014 Most Innovative Mobile App” at MWC Global Mobile Awards, in recognition of their popular mobile hand gesture camera app, CamMe. "We are happy to have our efforts recognized, confirming CamMe as a ground-breaking example of top tier technology translated seamlessly into an enjoyable and valuable consumer experience," said Assaf Gad, CMO of PointGrab. "CamMe has been so well received and the app just goes to prove that consumers want hand gesture control in their everyday lives when it is done in a practical and useful way." CamMe allows users to take a picture even when their phone is not in hand (from up to 16 feet away) simply requiring the user to raise a hand and make a fist to begin a countdown before the photo is taken. With over 1 million downloads to date, CamMe provides an example of a very practical integration of hand gesture technology for mobile platforms. PR Newswire: OmniVision announces that it is working with Google’s Advanced Technology and Projects (ATAP) team to develop tracking, mapping and motion in 3D. OmniVision’s new OV4682 and OV7251 image sensors provide imaging functionality to the project’s Android-based smartphone and development kit. 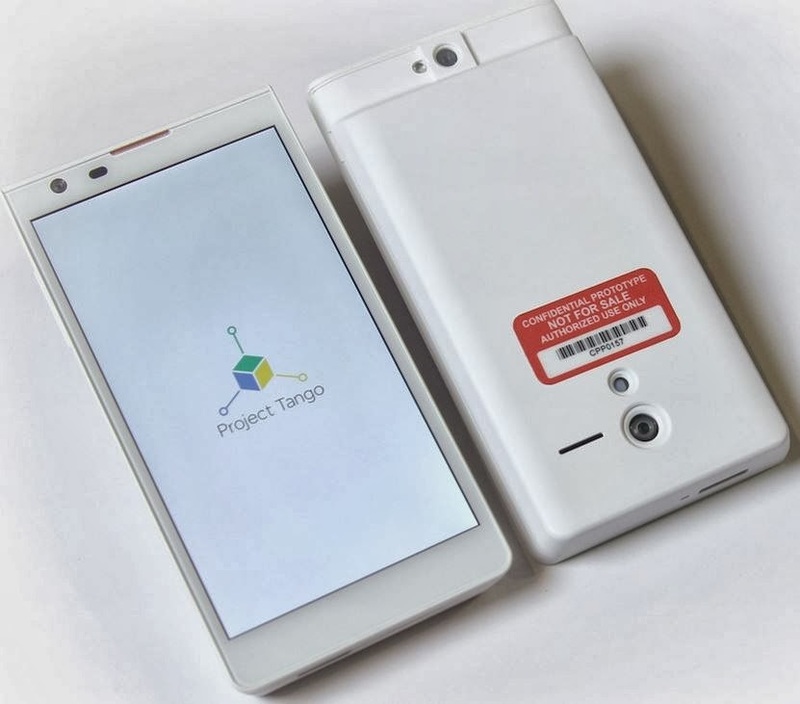 As the main camera, the OV4682 is the eye of Project Tango’s mobile device. The OV4682 is a 4MP RGB IR image sensor that captures high-resolution images and video as well as IR information, enabling depth analysis. The sensor features a 2um OmniBSI-2 pixel and records 4MP images and video in a 16:9 format at 90fps, with a quarter of the pixels dedicated to capturing IR. 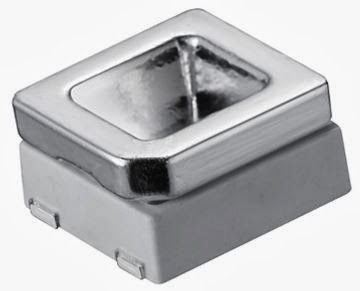 From the product page: "The sensor's 2-micron OmniBSI-2 pixel delivers excellent signal-to-noise ratio and IR sensitivity, and offers best-in-class low-light sensitivity with a 40 percent increase in sensitivity compared to the 1.75-micron OmniBSI-2 pixel. The OV4682's unique architecture and pixel optimization bring not only the best IR performance but also best-in-class image quality. Additionally, the sensor reduces system-level power consumption by optimizing RGB and IR timing." The OV7251 CameraChip sensor is capable of capturing VGA resolution video at 100fps using a global shutter. The low-power VGA sensor provides excellent low-light sensitivity and motion tracking information for device orientation data. D-PHY with expanded lanes and higher bandwidths which can provide over 20Gbps of performance, while still keeping costs low. M-PHY will continue to push performance with gear 3 (5.8Mbps/lane) which is available today and gear 4 (11.6Gbps/lane) which will be available later this year. MIPI PHYs, in conjunction with the latest versions of Camera Serial Interface (CSI) and Display Serial Interface (DSI) specifications, and aided by VESA compression technology, are able to support the industry’s newest technologies with higher speeds, better performance and more features. Most foundries do not offer microlens for pixels larger than 8um. 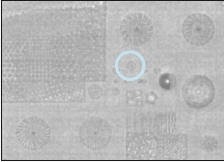 It appears that CSEM Muttenz (Switzerland) has a microlens process for pixels as large as 25um, possibly more. The microlens described in OSA paper "Measurement and modeling of microlenses fabricated on single-photon avalanche diode arrays for fill factor recovery" by Juan Mata Pavia, Martin Wolf, and Edoardo Charbon. "A quartz mold was utilized to imprint the microlenses in a sol-gel polymer on top of the SPAD array. The polymer used for the fabrication of the microlenses was ORMOCER. In the manufacturing process the polymer is deposited on top of the imager, the mold is then brought into contact with the polymer and pressure is applied. The polymer is then UV cured and thermally stabilized in an oven." LG Flagship Smartphone Features Qualcomm "Magic Focus"
Qualcomm announces that LG G Pro 2 smartphone features Qualcomm "Magic Focus" running on its Snapdragon 800 processor and allowing a Lytro or Pelican-style re-focus after the picture is taken. Qualcomm video explanation of its Magic Focus is in this post. Digitimes: Taiwan-based testing house King Yuan Electronics (KYEC) received large orders for CMOS sensors, according to a Chinese-language Commercial Times. KYEC utilization rate is expected to remain at 100% through Q3 2014. OmniVision and Aptina reportedly are among KYEC's image sensor customers. Real-Time HDR enables users to capture HDR photos or videos with no shutter lag or post-processing. Imagination announces its first IP core based on PowerVR Raptor imaging processor architecture. The high-performance, low-power, low-area PowerVR Series2 V2500 core targeting a broad range of devices from cost-sensitive, mass-market feature phones to automotive to connected home security to premium smartphones and tablets. The V2500 core joins PowerVR Series5 video and still image encoders and decoders to form a complete, integrated vision platform. The V2500 core supports of 4K video and high pixel count photography in mobile devices and tablets. The processing pipelines of the V2500 from CMOS sensor to RGB and YUV offer 1D and 2D image processing and image enhancement with a full local tonemapper for enhanced DR. The pixel depth of the pipeline can be configured to match the sensor, conserving power compared to ISPs with fixed datapath widths. Business Wire: Aptina will demonstrate the industry’s first 25MP mobile image sensor at Mobile World Congress in Barcelona this week. The new AR2520HS can capture full 25MP resolution and 4K video at 30fps, as well as delivers slow motion capture of 120fps for 1080p HD video all at full FOV. The sensor also supports Aptina MobileHDR technology. The AR2520HS’s BSI 1/2-inch optical format increases the light capture area by 88% over traditional 1/3-inch mobile image sensors. 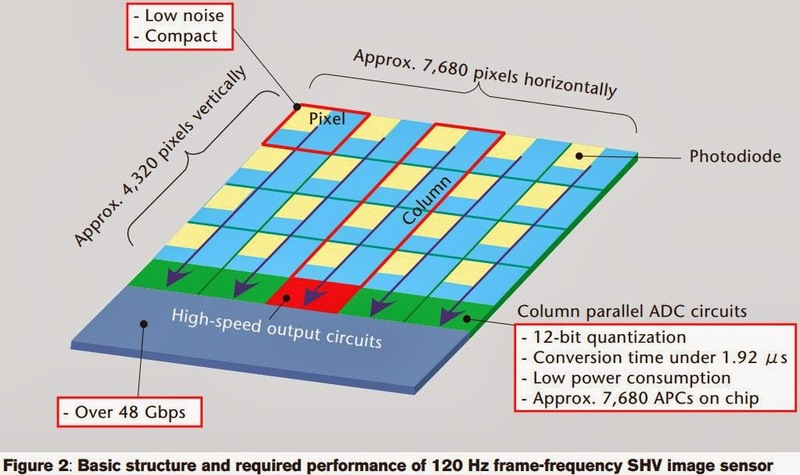 To ensure high-speed processing of full resolution video and still images, the AR2520HS uniquely outputs multi-gigabit data streams via both 8 lane MIPI and 12 lane HiSPi (High-Speed Pixel Interface). Compatability with existing Aptina 18 megapixel (AR1820HS) lens designs ensures that mobile OEMs and camera module makers can more rapidly design the AR2520HS into new devices. "The AR2520HS offers an astounding full field-of-view 120 frames-per-second slow motion capture. To further enhance the experience, this is coupled with our MobileHDR technology to ensure amazing mixed-light performance," said Sandor Barna, CTO at Aptina. "Aptina, with this ultra-high-performance sensor, is delivering the full camera experience into mobile phones and tablets." The AR2520HS will be available for sampling in Q2 2014. "The momentum in the camera market has shifted emphatically from digital still cameras to mobile devices. The market for image sensors in the mobile device segment was $4.9 billion in 2012, and is forecast to grow to $8.7 billion in 2017, and Aptina’s AR2520HS sensor is designed for this segment," said Brian O'Rourke, senior principal analyst of consumer electronics at IHS. DxO announces that it has licensed its Electronic Image Stabilization (DxO EIS) technology to ALCATEL ONETOUCH, a division of TCL Communication (Shenzhen, China), the world’s fifth-largest handset manufacturer. "The embedded imaging technology DxO will now deliver into our handsets sets a new benchmark in putting high image quality and professional-looking video results into the hands of our consumers, delivering an incredible camera experience. This is integral to our vision of creating smartphones that combine simplicity of use with best in class functionality,” says Dan Dery, CMO ALCATEL ONETOUCH. "We are very keen on partnering with ALCATEL ONETOUCH to bring our leading video stabilization solution to new markets," says Jerome Meniere, CEO of DxO. "Consumers are increasingly turning to their mobile phones as their primary video camera. While the visual quality of a video is driven by a number of factors, image stability adds significantly to the overall user experience. DxO EIS offers full steadicam-like image stabilization, comparable to professional camcorder devices, without the use of mechanical parts." 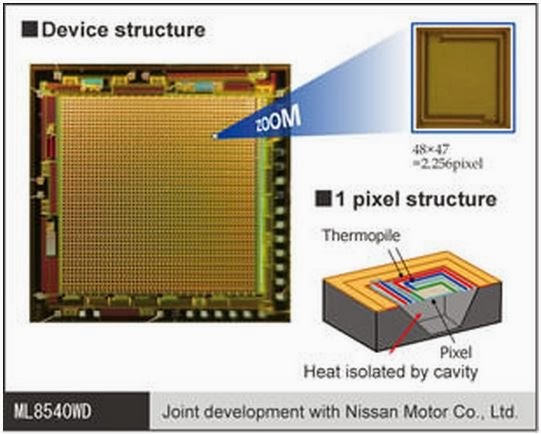 Another feature article talks about NHK R&D on high speed image sensors. "It is currently possible to purchase a monochrome camera with a resolution of 100,000 pixels that can capture video at up to ten million frames per second." Samsung Tomorrow blog introduces new flashes for smartphones and tablets. The new reflector-integrated flash LED ─ the 3432 1.8t (FH341A) delivers over 165 lux at 1A and a minimum CRI (Color Rendering Index) of 80. Another reflector integrated LED 3432 1.4t (FH341B) is specifically designed for extra-slim LED mobile solutions. The 3432 1.4t package includes a reflector and is only 1.4mm thick, fitting to smartphones and tablets thinner than 7mm. In addition, it provides a minimum illuminance level of 165 lux. "Over multiple iterations, we developed an architecture optimized for computer vision. The architecture favors parallelism, and not frequency. We're running [the Project Tango phone] on hundreds of megahertz, using a mix of hardware and programmable resources. On today's battery, running our processor will divide your battery power by a factor of 10." Albert Theuwissen continues his "How to Measure..." series of tutorials. The latest one describes the detailed procedure for measuring a Modulation Transfer Function (MTF). This is the first post in MTF series, to be continued. 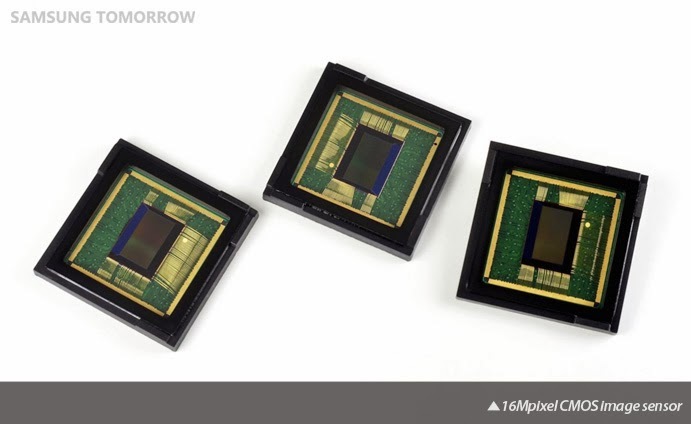 Business Wire: Toshiba announces T4K82, a 13MP, 1.12um BSI pixel CMOS sensor that allows smartphones and tablets to record 1080i video at 240fps, said to be the industry’s highest frame rate. Sample shipments are scheduled to start in March, with mass production to start in Sept 2014 with projected volume 2 million per month. "These characteristics are extremely important for security camera which often opens lens diaphragm during night-time shooting" (see Axis Communications' paper at IISW'2013). 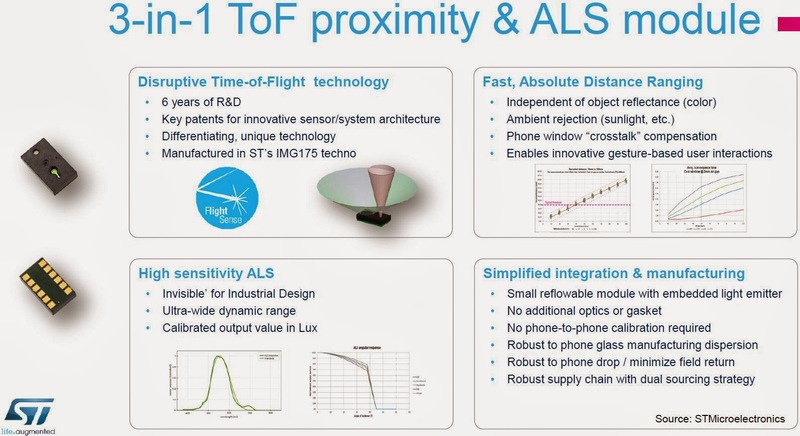 EETimes-Asia & EETimes-Europe give few numbers from Microsoft ToF sensor presentation at ISSCC 2014: "The image sensor is a 512x424 CMOS 3D time-of-flight with multi-frequency demodulation up to 130MHz at 2GSPS ADC. The device is reported to have a depth accuracy of 0.5 per cent at a range of between 0.8m and 4.2m." Microsoft announced that an enhanced sensor for Kinect for Windows will be available in summer 2014. Grand View Research publishes "Image Sensors Market Analysis And Segment Forecasts To 2020." Global image sensor shipments were estimated to be 1,797.9 million units in 2012; they are expected to reach 3,009.2 million units by 2020, growing at a CAGR of 6.7% from 2014 to 2020. 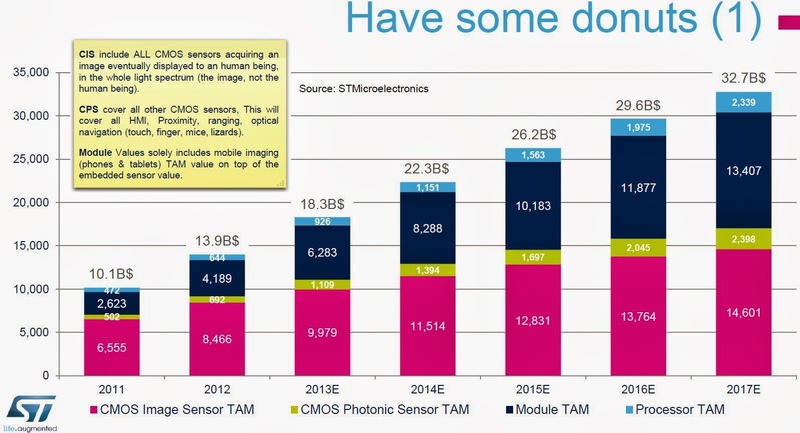 CMOS image sensors dominated the market in 2012, accounting for 83.2% of total shipments. 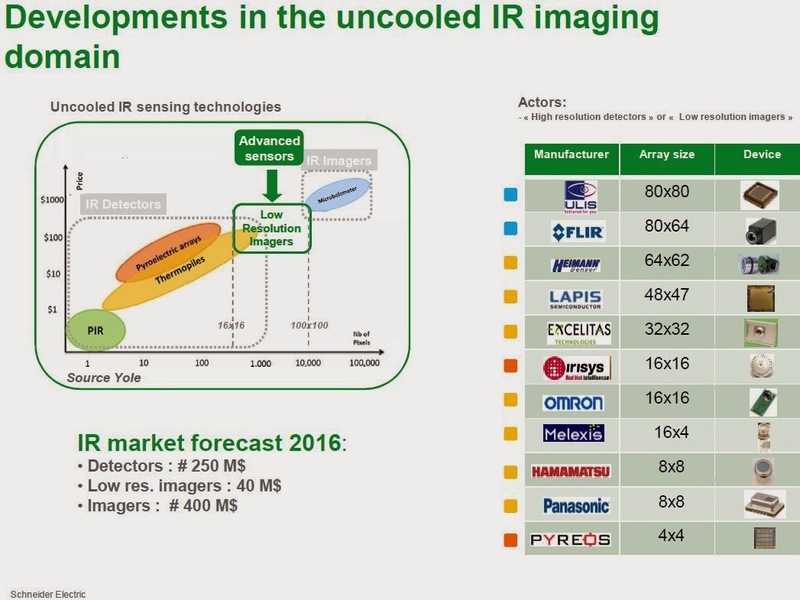 Contact image sensors (CIS) segment is estimated to grow at a CAGR of 4.4% from 2014 to 2020. Digital camera segment, including DSLR, was valued at USD 4,479.3 million in 2012. Medical applications are expected to be the fastest growing segment, with an estimated CAGR of 9.2% in terms of shipments from 2014 to 2020. Asia Pacific is expected to be the largest and fastest growing regional market during the forecast period. It accounted for 35.9% of the global shipments in 2012 and is expected to grow at a CAGR of 7.4% from 2014 to 2020.
Business Wire: At Mobile World Congress at Barcelona, Spain on Feb. 24─27, 2014, Aptina is to showcase advancements in its mobile imaging solutions including clear pixel Clarity+ technology and video quality MobileHDR. 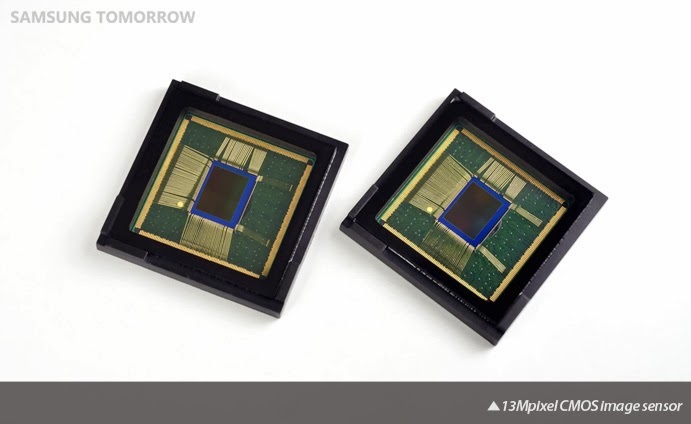 Additionally, Aptina will demonstrate its 8MP, 13MP, 18MP image sensors as well as its next-generation high-performance image sensor along with 4K video for mobile devices. No further details on MobileHDR is reported. Image Sensor Conference to be held in London, UK on March 18-20 publishes Renato Turchetta, Rutherford Appleton Laboratory, answers on high speed imaging questions. Renato is going to lead a pre-conference workshop on "A Million Images per Second and Beyond." A quote: "It looks like this field has suddenly started to move rapidly, so it wouldn't be unreasonable to expect more developments in the near future. 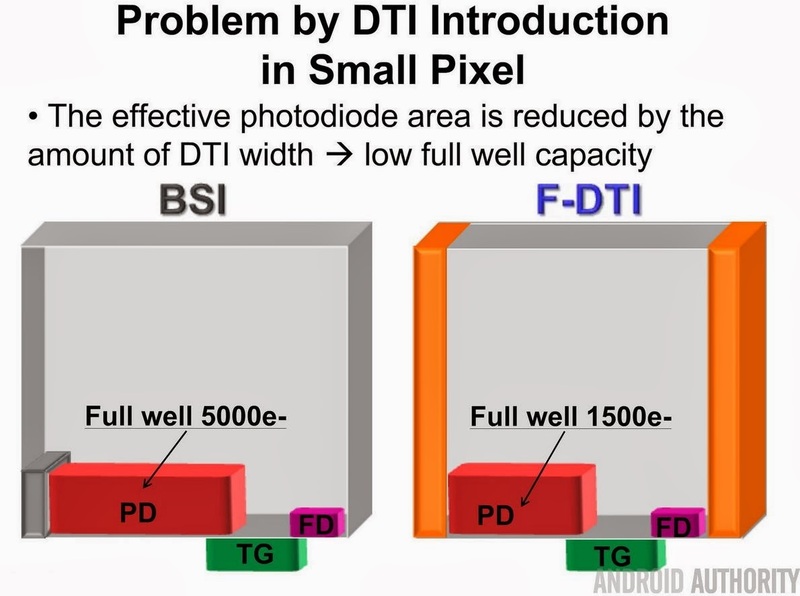 By the way, one of the new approaches uses CCD in CMOS and other applications are emerging for this 'new' technology. So are CMOS image sensors dinosaurs? And CCD as well?" Another publication of the conference is sort of a review of automotive ADAS market: "The market for ADAS systems is growing; analysis of the market has revealed possible growth at a rate of over 50% CAGR until 2018. Market value may also rise from the current value of around $18.5bn, to $165bn in the next five years." Albert Theuwissen reviews ISSCC 2014 imaging session. The review goes into detail on Samsung ISOCELL presentation, covering DTI and vertical TG. Also, the new Microsoft Kinect ToF sensor presentation is discussed. 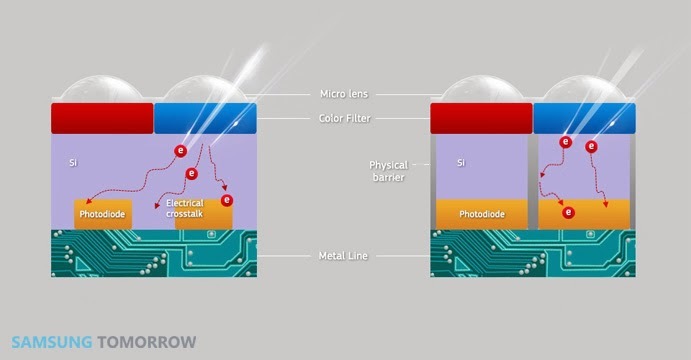 TSMC keeps working on various stacked sensor ideas. 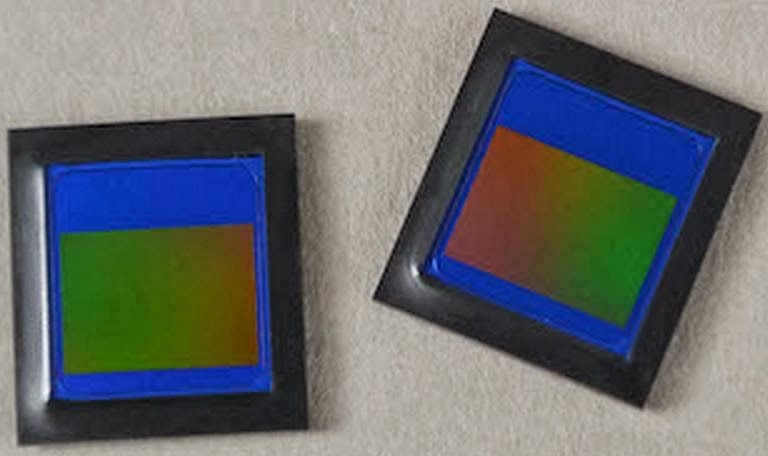 Two of the stacked sensor applications were published this week. 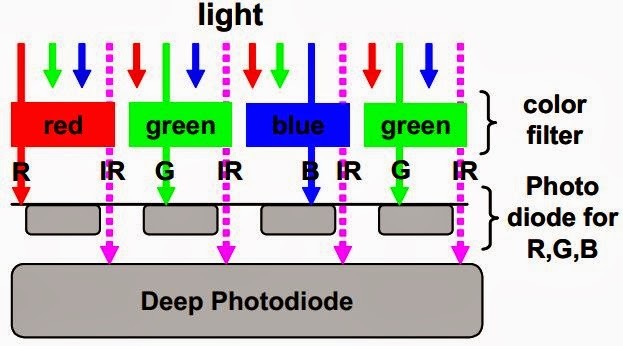 One of them, the US20140035083, talks about raised photodiode with Tx gate structure, while ther rest of pixel transistors are located on the logic chip: "Elevated Photodiode with a Stacked Scheme" by Meng-Hsun Wan, Yi-Shin Chu, Szu-Ying Chen, Pao-Tung Chen, Jen-Cheng Liu, Dun-Nian Yaung. PR Newswire: PixArt announces a design engagement with Pantech to offer a gesture motion capability for their IM-A880S (VEGA LTE-A) smart phone. The phone will feature PixArt Gesture Sensor PAC7620. The IR image-based PAC7620 Gesture Sensor creates a three-dimensional gesture space extending 6 inches above the phone to allow the user to interact with their phone by the nine user gestures (up, down, left, right, wave, forward, backward, clockwise, and counterclockwise). "Our company vision is to develop innovative human/machine interface solutions with our advanced imaging technologies. Providing the capability for users to easily operate their phones with simple hand movements creates a smooth, intuitive interaction for users to heighten their enjoyment of advanced technologies," said Dennis Lo, President, PixArt Imaging USA. "We believe this gesture sensor will help to spur new innovative trends in user gestures for application not only in smart phones but also in other devices as well." The PixArt Gesture Engine integrates into existing smart phones designs with its small form factor and standard I2C interface. The PAC7620 is said to provide a better gestures recognition in comparison to simple photodiode approaches. The PAC7620 also has lower power consumption and latency when compared to conventional cameras solutions paired with software gesture recognition. Android Authority publishes Samsung slides. 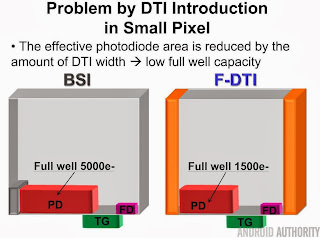 The web site says that "ISOCELL is actually the commercial name of what Samsung calls 3D-Backside Illuminated Pixel with Front-Side Deep-Trench Isolation (F-DTI) and Vertical Transfer Gate (VTG)." The slides below refer to a pixel size of 1.12um. More slides are at Android Authority site.